This property benefits from the installation of black finish modules to compliment the gray slate roof. Customer Feedback: 'Excellent installation, the best I've seen. Ion staff were very polite and hardworking. The quality of the installation and equipment installed were above reproach'. Original Solar PV Panel Array (2.2Kwp) - 12 Sharp NU185 Wp Modules. Four additional modules added following success of initial installation. Customer Feedback: 'A friend I recommended is very happy with their installation. I have recommended you to another who has an East/West orientation'. This 3.68kWp installation looks very comfortable on the roof of the wood-store/stable block. The owner extended the building specifically to accommodate a larger roof footprint to facilitate the PV installation. Customer Feedback: 'Great staff, very happy to consider changes even during the installation process. Being electrical engineers with very good attention to detail we gained confidence that the installation would be completed as planned. Would happily recommend to others'. This installation consisting of 10 Sanyo HIT H250E01 Black modules, working with an SMA SB 2500 Inverter, looks aesthetically pleasing on the grey slate roof. Note the lead 'soakers' dressed over the rail fixing brackets thus maintaining the total integrity of the slate roof covering. Large 18 module 3.9kWp installation utilising the roof of the barn out-building. Nice creative picture taken by our customer! This installation generated 3.1kWh by 10:45am on the first morning of operation! Customer Feedback: ' Difficult to fault, Michael was able to answer all of my questions - all potential errors were avoided'. 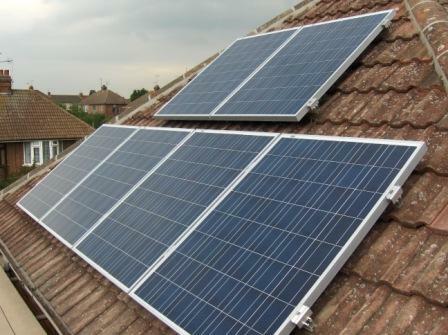 These black Sanyo FIT 235W modules provide the PV string for a 2.35kWp installation. This design, consists of 16 Sharp 245Wp modules and a SMA SB 4000TL inverter. The 3.9kwp system, required close co-operation with our customer to ensure that significant shading problems were overcome prior to installation. Solar PV Panel Array (2.2Kwp) - 12 Sharp NU185 Wp Modules. 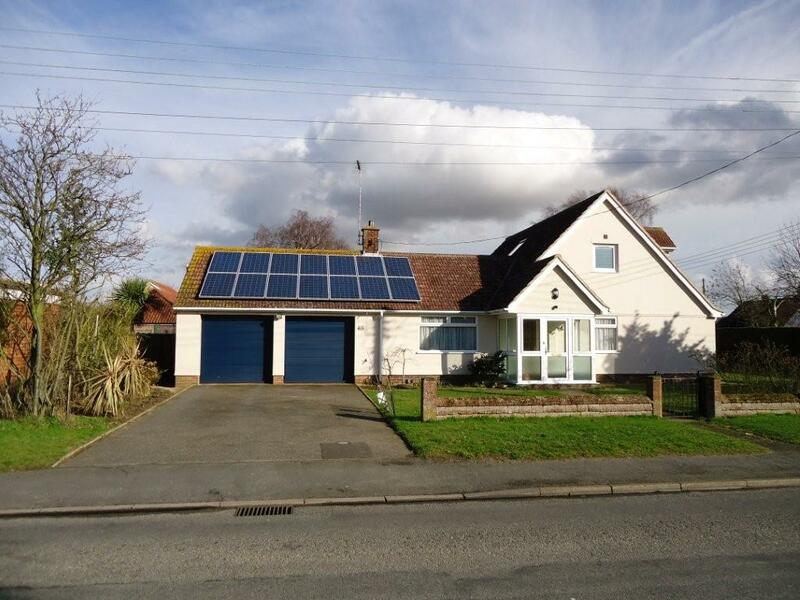 The solar panels look great installed on this bungalow roof in Washbrook, the blue sky and the green background looks like someone has edited the photo, but this photo was taken by our engineer, proving that we do get sunny days in the UK! This installation design required tree shading problems to be overcome. You will notice that the black finish Romag 185Wp modules are sited to the left area of the roof to ensure optimum performance and avoid shading problems due to the nearby trees. The installation utilises a SMA SB 3000HF inverter. This installation utilises 14 Dimplex 230Wp modules. Note the design required the positioning of the modules to the left of the roof, thus avoiding shading problems from the main roof. Customer Feedback: ' The installation process from enquiry to finish was excellent. The equipment installed is of high quality and the Dimplex panels are certainly doing their job. A very pleasant and efficient team, great care taken both inside and out to avoid any mess. 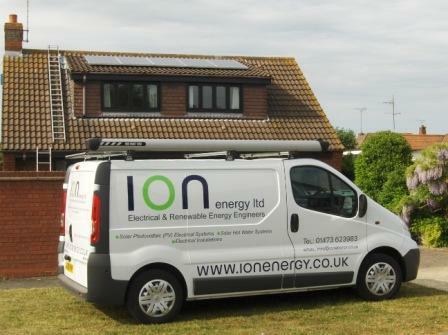 We would certainly recommend Ion Energy to anyone interested in the installation of Solar PV and believe we have received great value for the cost of the outlay. We are looking forward to our FIT payments!'. 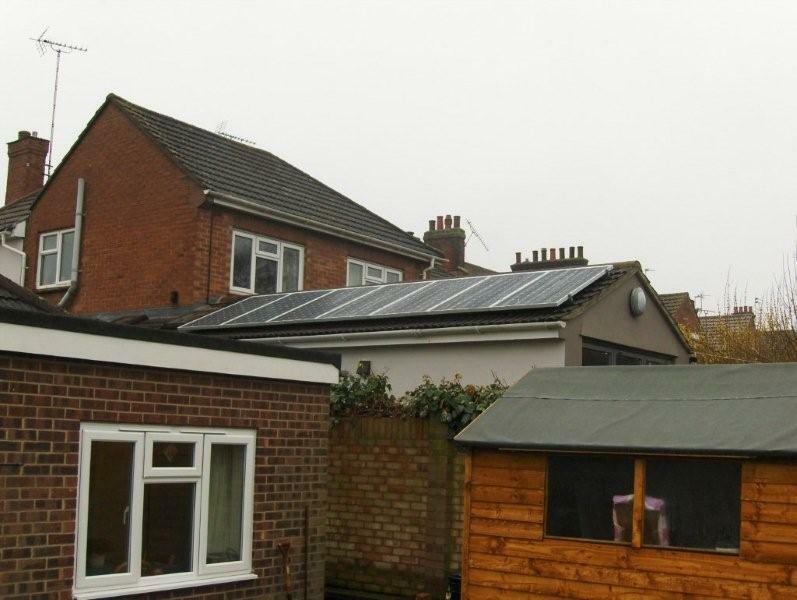 This installation maximises some available roof-space on a building extension to the rear of the property. Solar PV Panel Array (2.35Kwp) - 10 Sharp NU235 Wp Modules. 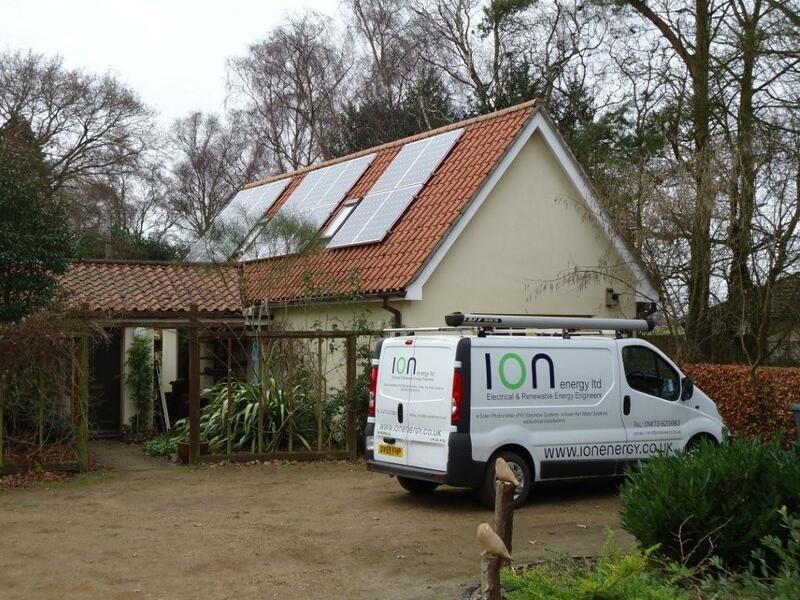 Customer Feedback: ' We were delighted with our PV system. Thank you and your team for the neat and tidy installation and careful explanation of how the system works. We will definitely recommend you'. 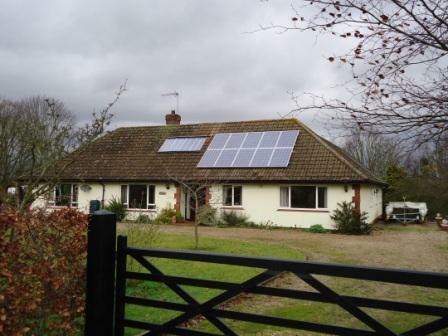 These neighbours now both enjoy the benefit of their Solar PV installations. Module array (2.2Kwp) - 12 Sharp NU185 Wp Modules. Customer Feedback: ' Service excellent including installation/after sales follow-up. Your company went that extra mile in all aspects'. 'We liked the fact that it was the owner and not a sales rep who made the site visit/survey. There was no pressure and we were encouraged to approach another company. The installation team were friendly and competent keeping disruption to a minimum. Our property was respected at every stage of the procedure'. This installation has two separate Solar panel arrays facing South and East, the two systems have separate inverters and energy monitors and the real time outputs from the two solar panel arrays are shown on an ingenious website created by the owner, which makes fascinating reading. Click here to view the output of this system. A 1.3 kWp system fitted to garage/workshop roof. Solar PV Panel Array & Inverter (1.1Kwp) - Sharp ND220 Wp Modules. This installation is on a shallow 20 degree dormer roof. 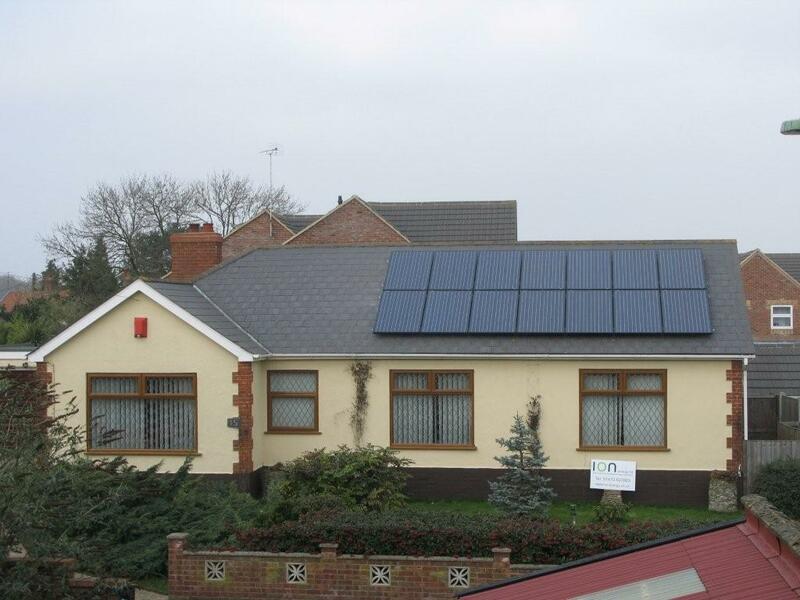 The solar PV panels are very discrete and can only be seen from the far side of the road. The performance of these panels generated a return of £200-00p in the first quarter of operation, a very good result for a modest sized installation! This installation also benefits from the use of black finish modules presented in portrait mode. Particular design and installation issues were overcome here due to the presence of significant modulations on the roof surface both from top to bottom and also across its width.. Customer Feedback: ' I really did appreciate the 'soft-sell' approach which made me fully aware of the possible problems with the system installation. I felt I was well informed about all of the issues. Thanks for a brilliant service!'. 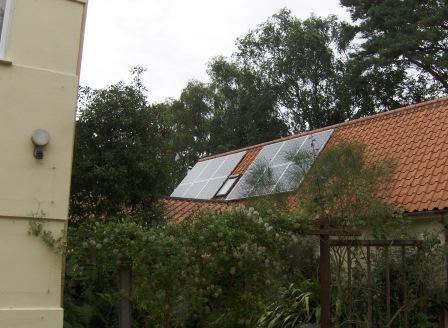 Both types of Solar technologies are seen here, fitted to our own house. Our Hot Water has been heated by Solar Panels for some time and has been a great success. 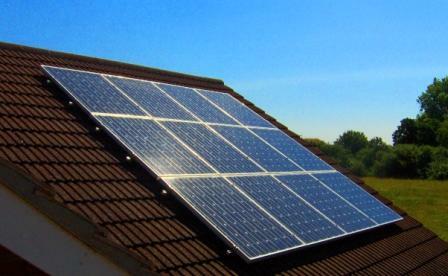 When the new Feed-In-Tariff for solar electricity microgeneration was announced, we were only too pleased to take advantage of free green energy from sunlight to reduce our electricity bills too! The house now costs very little to run and the feel good factor is enormous! Drop me an email to find out how to join us in reducing both your carbon footprint and your gas and electricity bills.